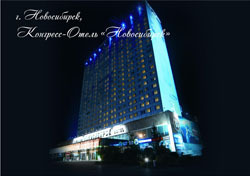 Congress-hotel "Novosibirsk” is the biggest hotel in the city an the highest building of the geographical centre of Russia. It is situated at the crossing of two central streets opposite the main railway station. Close location to the Metro station (100 meters) helps people to reach any destination in the city in a very short time. Banks, trading and entertainment centers, theaters and museums are also in a few steps away from the hotel. The key count of the hotel is 430 rooms of different categories: from luxurious "Suits” to practical "Standards”. All the rooms are equipped with split air conditioning system, telephone, refrigerator, satellite television and free Internet access by wireless system. The hotel offers a modern Congress Centre with simultaneous interpretation service, 2 restaurants with wide range of European and Asian cuisines and free secured parking. All the guests have a health centre at their disposal, a beauty salon, a sauna and the billiards. The regular hotel visitors are top managers of leading Russian and foreign companies, - celebrities, famous actors and actresses - and outstanding sportsmen. High operational Standards and professional staff are the best recommendation for the guests.